The Heart of Dixie Railroad Museum welcomes those who may need special accomodations during their visit. Our museum is located on flat land with a paved parking lot and level side walks. The Boone Library (Woodlawn Depot) and our Depot Museum (Calera Depot) have wheelchair ramps. The Calera Depot does have a couple of steps leading from the waiting room and ticket window area to the Baggage room which houses some of our displays. If you will be riding the train with us, we do provide assistance with a wheelchair lift which can be used for wheelchairs, or anyone who may not have be able to climb the stairs on our coaches. 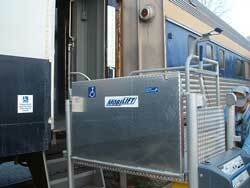 Not all coaches are accessible but we do provide accessible seating in the Long Island Car and one of the Open Air Cars. The Gift Shop is fully accessible and contains ADA compliant restrooms. Wheelchair loading and unloading may be unavailable for events unloading at areas other than the Calera Depot for such events as the Cottontail Express, Ozan Wine Train and the Pumpkin Patch Express. If you have any questions or concerns, please contact the museum office at [email protected] or by phone (205) 668-3435.